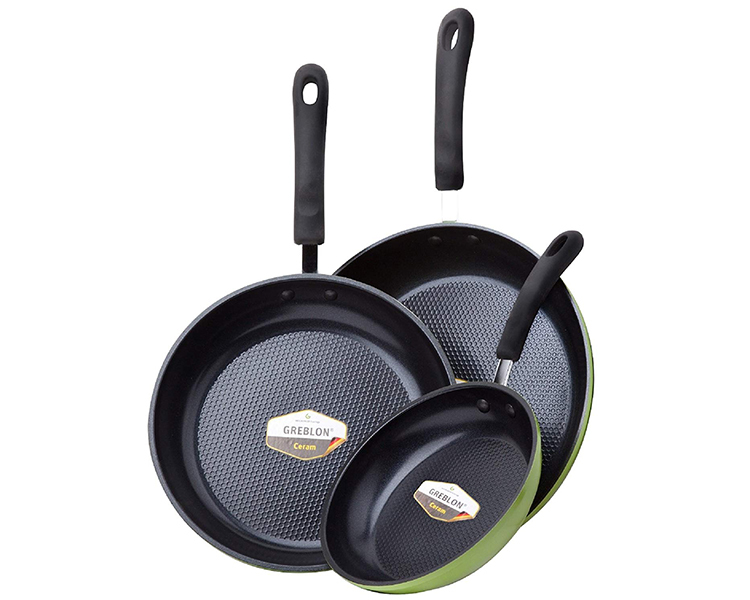 Utilizing GREBLON -- an ultra-safe dual ceramic coating from Germany, the Green Earth Pan Set by Ozeri includes 3 award-winning frying pans that achieve non-stick perfection while remaining absolutely free of PTFE, PFOA and APEO. 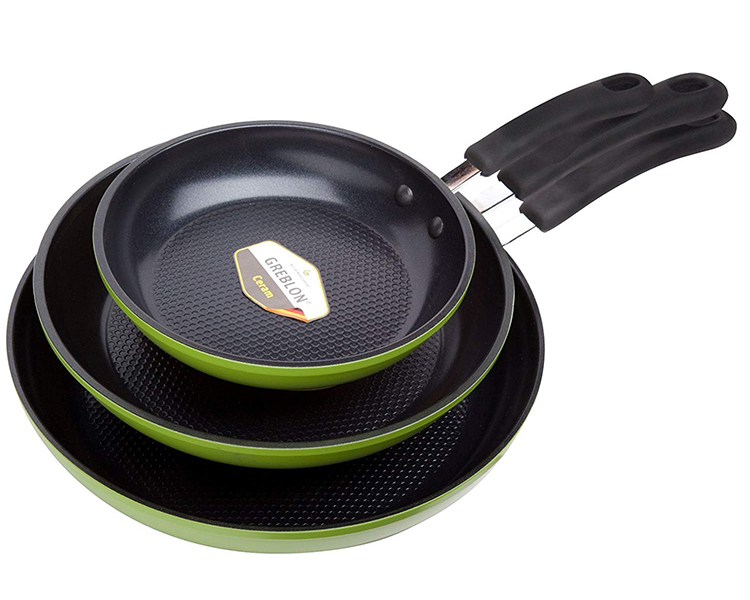 The Green Earth Frying Pan Set by Ozeri includes an 8, 10 and 12 inch pan with each pan featuring a honeycomb ceramic cooking surface designed to prevent food bonding. The elevations of the textured cooking surface also create air pockets which distribute heat underneath food to enhance cooking performance. 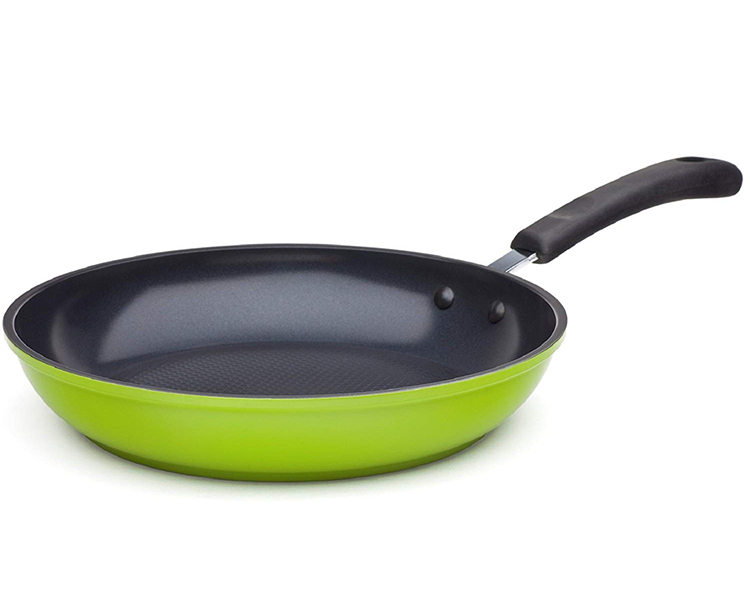 Conventional cookware and other ceramic cookware brands achieve their non-stick performance through a coating of PTFE (PolyTetraFluoroEthylene), a synthetic substance that has waxy properties. At very high temperatures, PTFE begins to decompose and release fumes which are documented to be lethal to birds and small pets, and can be harmful to humans. In addition, traditional pans incorporating PTFE are often manufactured with the aid of PFOA (PerFluoroOctanoic Acid), which the EPA has classified as a 'persistent pollutant of the environment', and APEO (Alkylphenol ethoxylates), which are under restricted use in Germany due to environmental concerns about their poor biodegradability, toxicity to aquatic life, and potential to act as endocrine disrupters. 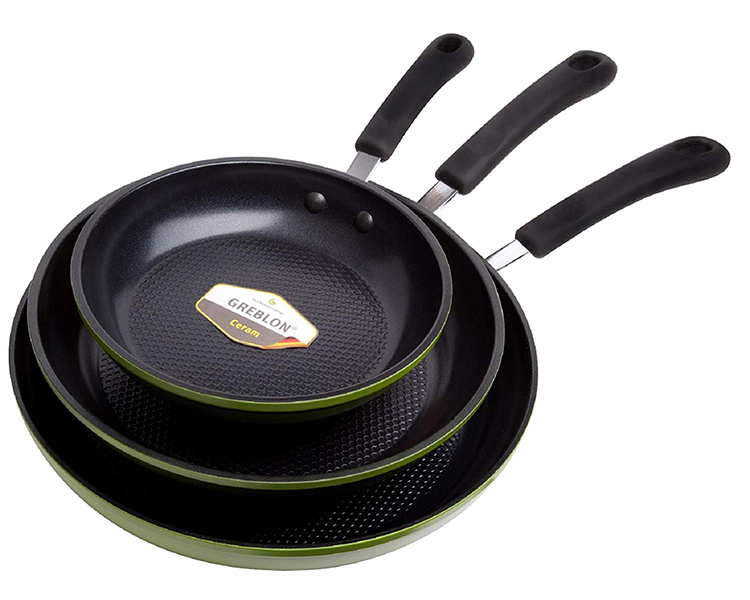 With the Green Earth Pan's GREBLON ceramic, even under high temperatures, no harmful toxic fumes are ever released into the environment. This is because each pan utilizes a 100% ceramic coating inspired by nature - not a laboratory. 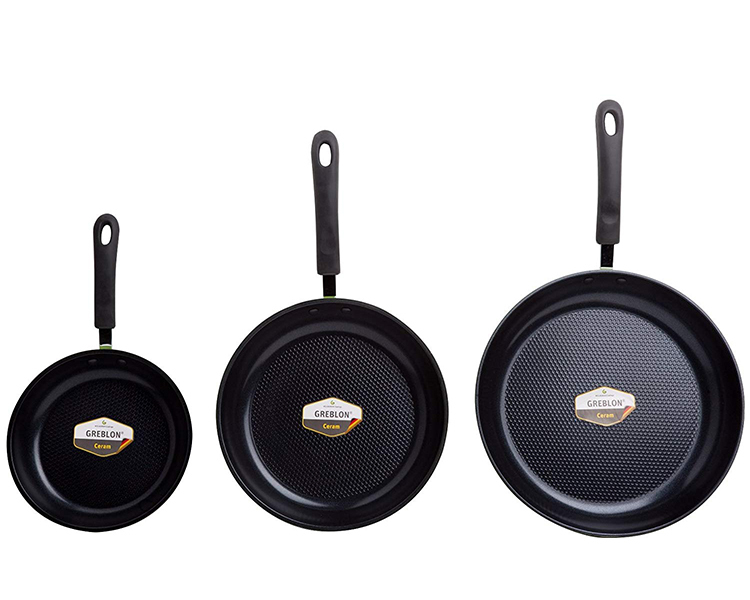 In addition to being completely free of PTFE, PFOA and APEO, each pan is also far more durable and scratch-resistant than other non-stick surfaces. 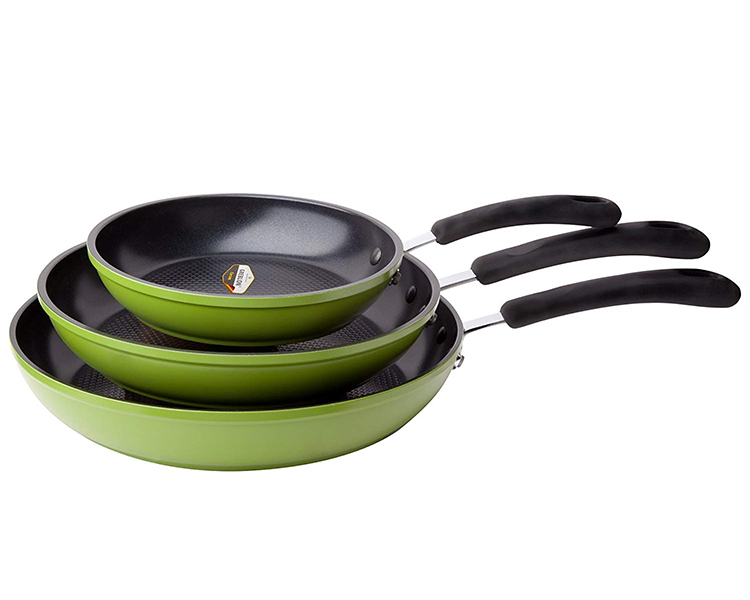 With better non-stick properties, the Green Earth Pan allows you to saute, fry, bake, boil and braise with as little as half the amount of oil normally used, and cleaning is a breeze. 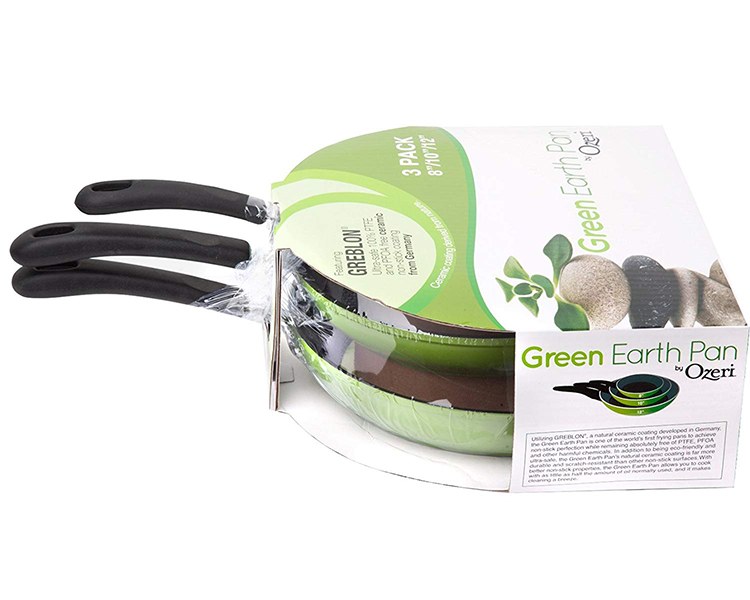 Each Green Earth Pan is made of the highest quality die-cast aluminum that allows for even cooking and fantastic browning without hot spots. Each pan boasts a magnetized bottom for rapid heat transfer on induction stoves, and a heat resistant silicone coated handle. GREBLON ceramic made by Weilburger GmbH, Germany. Final assembly in China.